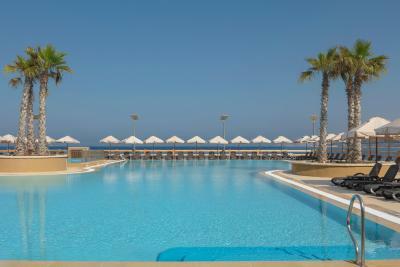 Lock in a great price for The Westin Dragonara Resort – rated 8.8 by recent guests! Wonderful buffet dinner on Sat night and Sunday lunch. I would end up going on forever and so to sum it all up, eveything was superb, from the room and bathroom to the food and the facilities. Also, top notch staff who always greet you with a smile and have an answer to any query which one might have. Bravo S.P.G. Nice gym but that's pretty much all. Room was OK.
Good location but many other hotels have the same advantage. The proximity to all sorts of restaurants and a supermarket. 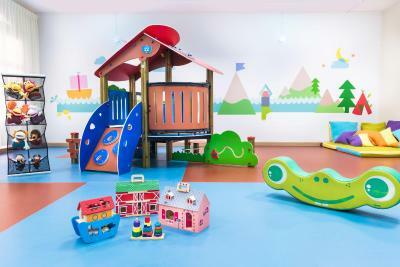 The reasonable rates for the Kid’s Club. The friendliness of the housekeeping and front-desk staff. Staffers were highly professional n customer friendly. The most exquisite experience ever. You won’t get rooms that spacious elsewhere. The first reason I would like to visit Malta again if I get a chance. very nice resort with a top location, walking distance to the heart of st. julians. great buffet breakfast. very nice room (executive on 7th floor) for a family of 2+2 with a big sea view balcony. staff very friendly and helpful. 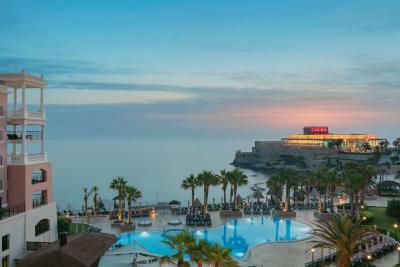 The Westin Dragonara Resort This rating is a reflection of how the property compares to the industry standard when it comes to price, facilities and services available. It's based on a self-evaluation by the property. Use this rating to help choose your stay! 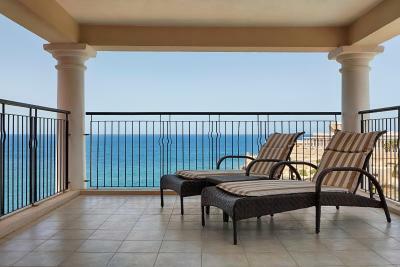 One of our top picks in St. Julianʼs.Overlooking the Mediterranean Sea in St Julian's, The Westin Dragonara Resort offers 2 private beaches, indoor and outdoor swimming pools, and 3 restaurants. Reception is open 24 hours a day. 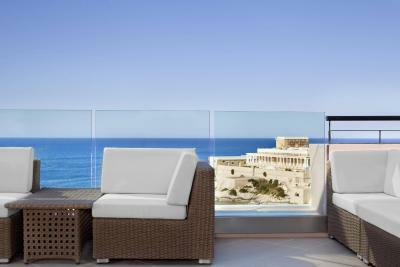 The spacious, air-conditioned accommodations features a terrace with views of the sea. 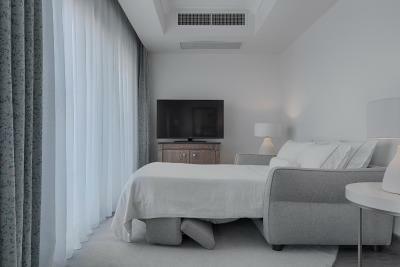 Each room comes with a mini-bar, tea/coffee maker, and LCD TV with satellite channels. 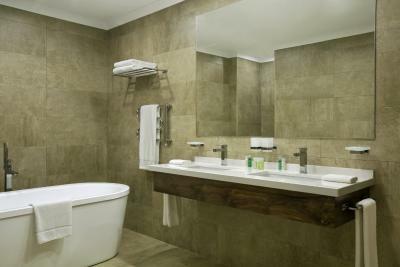 Some suites offer a spa bath, and some rooms include access to the Executive Club Lounge. Free WiFi is available in the lobby and in the restaurant. Guests can relax in the hot tub, enjoy a massage, or sit out on the Bayview sun terrace, equipped with free sun beds and parasols. The gym is complete with modern machineries and weights. 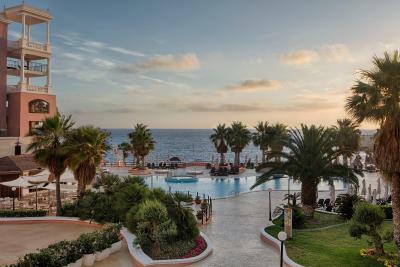 The Dragonara Resort's restaurants serve Maltese and Mediterranean cuisine. The award-winning Terrace restaurant offers a daily buffet breakfast all year-round and a daily themed buffet dinner in July and August. Drinks are available until late at the lobby's bar. The resort is a 5-minute walk from St Julian's Bus Terminus and 2,650 feet from St Julian's Bay. Free parking is available on site. 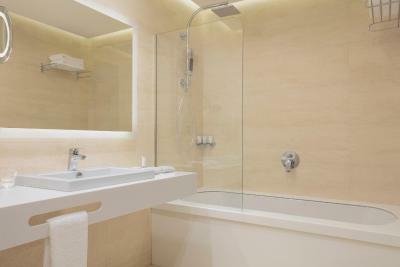 뀐 Located in the real heart of St. Julianʼs, this property has an excellent location score of 8.9! 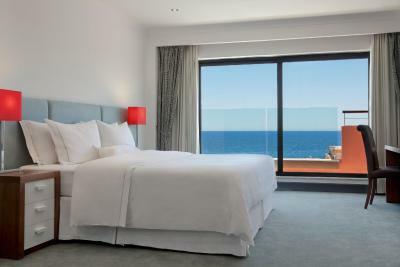 When would you like to stay at The Westin Dragonara Resort? 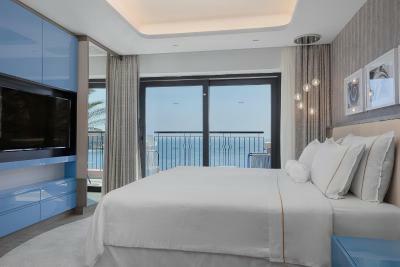 This extra-large room offers sea views from its balcony, 2 Heavenly Queen Beds and a LED TV. This room includes access to the Executive Club Lounge, with free buffet breakfast and free snacks and drinks throughout the day. This extra-large room offers sea views from its balcony. Also features a Westin Heavenly Bed, a LED TV and tea/coffee making facilities. This extra-large room offers sea views from its balcony. 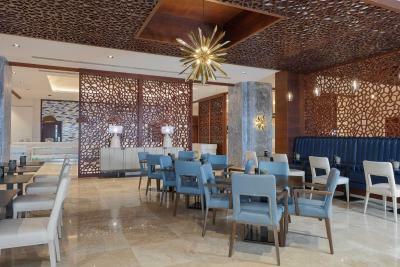 Features 2 Westin Heavenly Beds, a LED TV and tea/coffee making facilities. 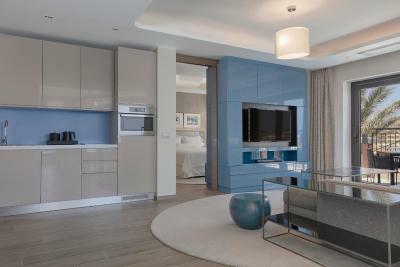 This suite consists of a double bedroom, a separate living area with sofa bed and a fully equipped kitchenette. 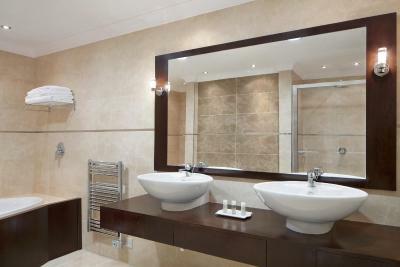 Also includes 2 LED TVs, a bathroom with free-standing bath, and a bathroom with a shower with rainfall shower head. WiFi is free. 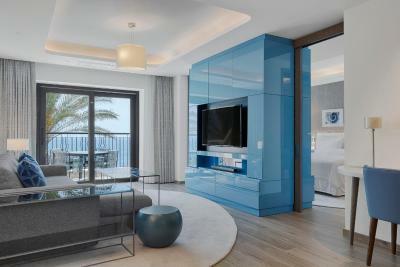 This air-conditioned junior suite offers 2 sea-view balconies, 2 LED satellite TVs and a mini-bar. Also features a seating area with desk, a kettle and bottle of water. The bathroom includes bathrobes and slippers. 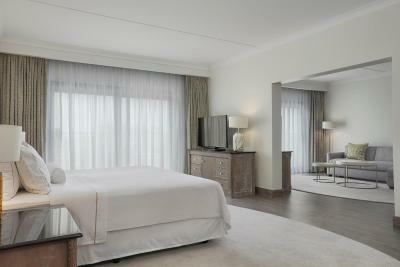 This spacious open-plan junior suite offers 2 balconies, 2 LED TVs and 2 Westin Heavenly Queen Beds. Also includes a mini-bar, a seating area and a private bathroom with bathrobes. 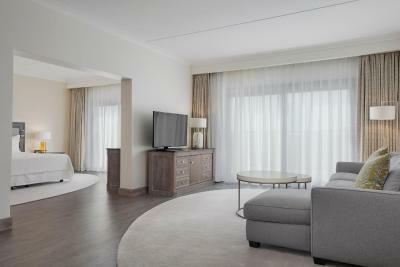 This spacious, rooftop suite features 2 balconies, an open-plan living area and 1 Westin Heavenly Bed. Includes access to the Executive Club Lounge. 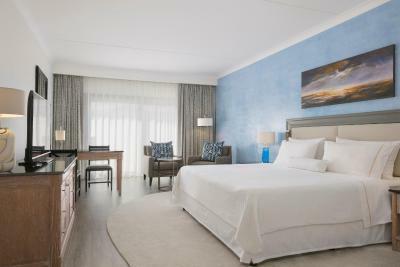 The extra-large room offers sea views from its balcony, 1 Westin Heavenly King Bed and a LED TV. Also includes access to the Executive Club, with free buffer breakfast, free snacks and drinks throughout the day. This rooftop suite features a terrace with hot tub and shower. 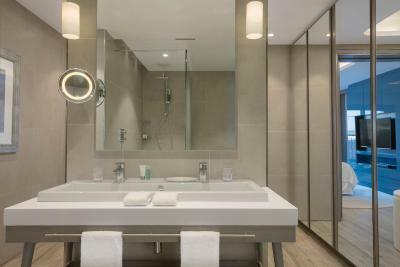 Has 1 Westin Heavenly bed, 2 LED TVs and a large bathroom with bath and shower. Also includes access to the Executive Club Lounge. 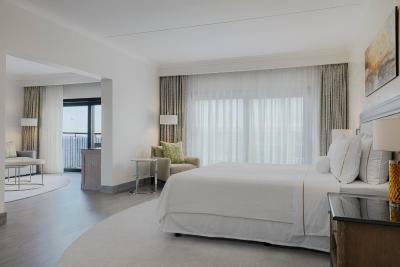 This spacious room offers sea views from its large balcony, a Westin Heavenly Bed, and air conditioning. A kettle and LED TV are included. 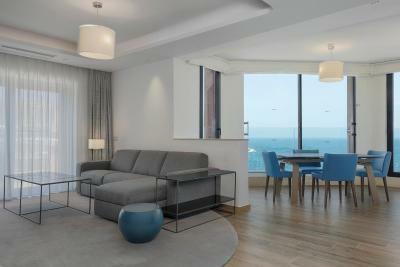 This spacious room offers sea views from its large balcony. Features 2 Westin Heavenly Beds, air conditioning and a kettle. Also includes a LED TV. This extra-large room offers sea views from its large terrace. It features a Westin Heavenly Bed and an LED TV. Tea and coffee making facilities are included. Children under 12 stay free of charge. Older guests must pay a supplement for extra beds. This extra-large room offers sea views from its large terrace. 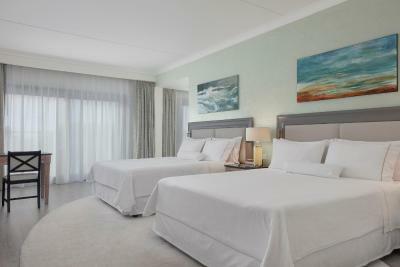 The room features 2 Westin Heavenly Beds, a LED TV and tea/coffee making facilities. 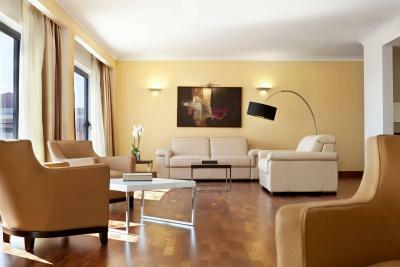 This suite has 2 bedrooms with attached bathroom, a fully equipped kitchenette and a living room with sofa bed. Also features a dining area and free WiFi. 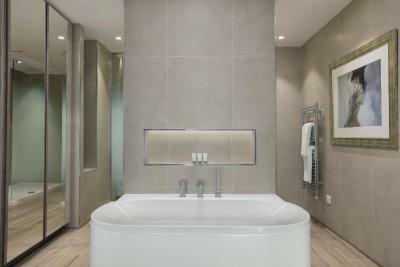 This suite has 3 bedrooms with attached bathroom, a spa bath and a large living room. Features a fully equipped kitchen, dining area and free WiFi. Also includes access to the Executive Club Lounge. This double room features a balcony, electric kettle and flat-screen TV. 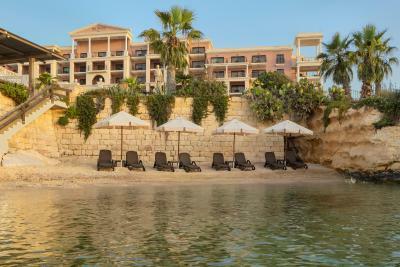 The Westin Dragonara Resort enjoys a privileged location on a private peninsula measuring 74,000m² in St. Julian's. 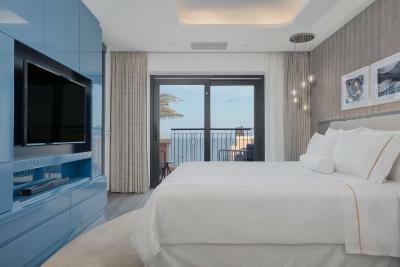 All our spacious guest rooms and suites feature a balcony or terrace and enjoy beautiful sea views. 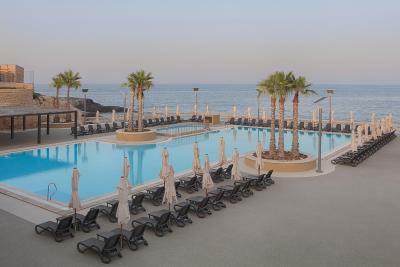 The Resort offers 2 outdoor pools and private beach lidos, with direct access to the Mediterranean Sea, and 1 indoor heated pool. A number of restaurants and bars are also available, all of which have sea view terraces for al fresco dining during the summer months. 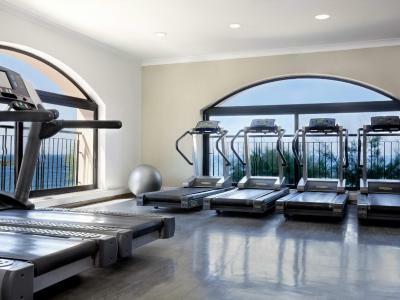 The WestinWORKOUT Fitness Studio includes a large, fully equipped gym, indoor jacuzzi, steam room and sauna. The Dragonara Casino is within a short walking distance from the hotel. 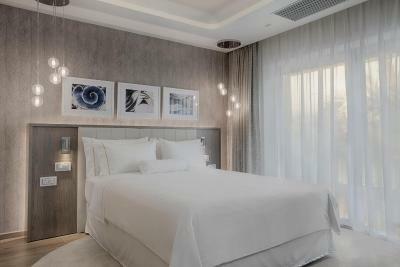 In summary, The Westin Dragonara Resort is the ideal hotel whether you're planning a holiday as a couple or with children, or even if you're travelling on business. House Rules The Westin Dragonara Resort takes special requests – add in the next step! The Westin Dragonara Resort accepts these cards and reserves the right to temporarily hold an amount prior to arrival. Please make sure that the name on the credit card used for the booking corresponds to the guest staying at the property. Otherwise, a third-party authorization by the cardholder must be submitted when booking. Please note that the credit card used for the booking must be shown at check-in. The Bayview pools, bar and beach are open from April to October. The Reef Club is open from June until September. The indoor pool and fitness center are open all-year round. Children under 12 are not allowed in the Executive Lounge from 18:00 until 20:00. Please inform The Westin Dragonara Resort of your expected arrival time in advance. You can use the Special Requests box when booking, or contact the property directly using the contact details in your confirmation. The best reception staff !! all very welcoming! the rooms are very big! clean! I recommend everyone a view of the sea!